As heavy, wet snow blanketed New York City last month and then quickly turned to slush, the sidewalks in front of some luxury apartment buildings remained pristine. As if by magic, snowflakes melted as they touched the ground in front of these upscale addresses, releasing a faint vapor that hung momentarily in the bitter cold before vanishing altogether, thanks to what is turning out to be the ultimate amenity in an unrelenting winter: heated sidewalks. He paused to open the door for a high-heeled resident who strode briskly across the glistening pavement to a car waiting by the curb, seemingly oblivious to the slush nearby. Ubiquitous in luxury ski resorts out West, heated sidewalks are a rarity in New York City. 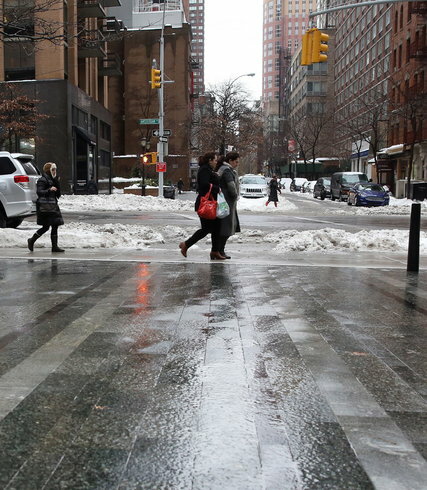 Just 14 applications were filed for heated sidewalks in the last decade, according to the New York City Department of Transportation. That may be partly because the wintry mix the city typically receives is more manageable than the relentless battering of snow, ice and sleet experienced this year. Expense is also an issue, with installation costs in the six-figure range for a large sidewalk. The application process can be onerous, requiring a public hearing and substantial fees for the use of space underneath sidewalks. Not to mention the risk of damage if, say, the city needs to dig up the sidewalk for any reason. And these sidewalks don’t exactly elicit kind words from the eco-oriented crowd. But in a winter more siege than season, the feature is drawing new attention. Suppliers say interest and inquiries have picked up recently from homeowners sick of shoveling. Developers looking for a new way to stand out from an already amenity-laden crowd have taken note, as the immaculate condition of entryways with heated sidewalks has emerged as a clear distinguisher amid the harshest winter in years. “I think it may be the start of a trend,” said Stephen G. Kliegerman, the president of Terra Development Marketing, which advises Halstead Property and Brown Harris Stevens. He is working on two new residential projects — 101 West 78th Street on the Upper West Side and 19 Park Place, a 21-story condominium in TriBeCa — that plan to install the systems. Indeed, heated sidewalks are an uncommon luxury. Uponor, a provider of radiant heating systems, has installed two to three snowmelt systems a year over the past 10 years in New York City, including heated driveways at residential buildings and walkways at the Staten Island Ferry Whitehall Terminal in Lower Manhattan. Last year, Rathe Associates, a supplier of such systems to contractors, engineers and developers, sold about 100 control units across the five boroughs and in Nassau, Suffolk and Westchester counties. A search for Manhattan properties for sale with heated sidewalks turned up Ludlow Lofts, a Lower East side condo where a three-bedroom is listed by Halstead Property for $1,595,000 as an investor unit; and at the ultra-high end, an Upper East Side mansion, 12 East 69th Street, listed with Corcoran for $114,077,000 (the exterior staircase is also heated). Extell Development, which installed heated sidewalks at 535 West End Avenue, has yet to incorporate the feature in any other building. The company declined to comment as to why, but those in the industry say the application process is one deterrent. Property owners must first apply for “revocable consent” from the Department of Transportation for the right to construct and maintain a snowmelt system under the sidewalk, as it is city property. The process often includes community board reviews and generally takes between four and six months. As the name implies, the department retains the right to revoke consent at any time. On top of this, an annual fee is associated with the use of the sidewalk that is based on factors ranging from the “volume of the installation” to property values, according to the transportation department. Developers who have installed the systems and real estate lawyers who have researched the costs for residential developments have calculated fees anywhere from $6,000 to $20,000. And that doesn’t count how much it costs to operate when there is a big storm. So-called snowmelt systems come in two basic varieties. Electric systems, which rely on electric coils under the pavement, can be easy to install but costly to run at anywhere from $9,000 to $14,500 a year for 1,000 square feet of sidewalk, according to Megan Gilman, the president of Active Energies, energy consultants in Colorado. Hydronic systems, which rely on plastic tubing looped beneath the sidewalk and contain a mixture of antifreeze and water that is heated by a boiler, have a higher upfront cost but can be less expensive to operate, averaging between $2,000 and $3,000 per 1,000 square feet a year. “Cost-wise, it’s expensive,” acknowledged Yoel Sabel, the director of Halcyon Management Group. Halcyon recently completed a $300,000 installation of nearly 8,000 square feet of heated sidewalks at 101 Bedford Avenue, a new four-building rental complex in Williamsburg. But the investment, he said, is worth it for the safety and peace of mind it affords. “If someone doesn’t show up because it’s snowing or the middle of the night, it will still get cleaned automatically,” said Mr. Sabel, who employs a system supplied by Rathe Associates. With a heated sidewalk, not only is the doorway clear, but people aren’t dragging as much snow into the lobby, reducing the probability of slips and falls, he added. Plus, it frees up building staff to focus on other duties. Instead of chopping up ice on the sidewalk, for example, they can make sure that basement pipes are not freezing. Heated sidewalks can also cut down on winter wear and tear. Newcastle has worked with Progeny Restoration on heated sidewalk installations for at least two townhouses on the Upper East Side and has plans for more. Residents of buildings with heated pathways tend to agree. After a recent snowstorm, Guy Muzio said his commute home from work required trudging through slush and dodging icy pools of muddy water at each street corner. But it all faded away upon arriving at the heated courtyard at One Morton Square in the far West Village, where he is the president of the condominium association. The most advanced snowmelt systems can be programmed to automatically turn on when sensors in the sidewalk detect precipitation combined with temperatures below freezing and have different zones and sensors capable of responding to runoff and other factors. There are ways to curb the energy used for snow melting, such as insulating the coils and using systems that can be programmed to turn on at the freezing point. But, Ms. Gilman said, many systems are kept “idling” well before the temperature drops to avoid snow buildup while the system is powering up at the start of a storm. And sometimes runoff can cause the system to operate even if it is not snowing. Peter Pennoyer, a New York architect, has installed such systems on behalf of clients with suburban luxury homes, but doesn’t recommend them.